(S) Mens Vintage Western Shirt! Brown, White, Tam & Sienna Windowpane Plaid! 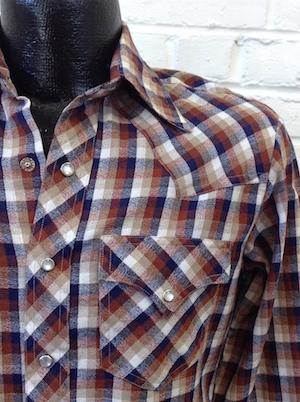 Home > Vintage Western Shirts > XS & SMALL Western Shirts > (S) Mens Vintage Western Shirt! Brown, White, Tam & Sienna Windowpane Plaid! Mens Vintage Western Shirt! 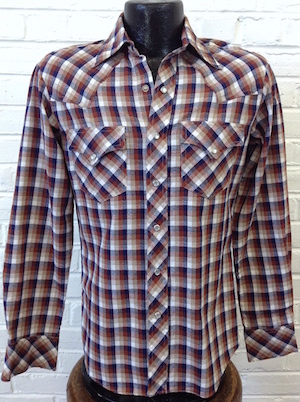 A great cowboy shirt in brown, white, tan and sienna windowpane plaid with tan top stitching! Pearly white plastic snaps down the front with four matching snaps on each cuff. Two pockets on the chest, each with a western style pointed flap and button closure. Shirt has a tapered hem. Tagged by Rocking K Ranch. Cotton/Polyester blend.